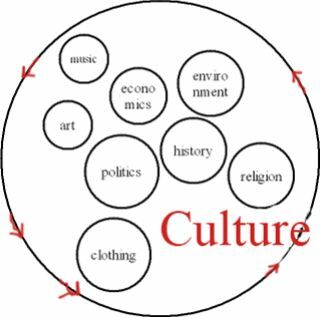 Culture is a term that defines the characteristics of people of a specific area at a specific time.These characteristics are mostly their behavior,their beliefs, their way of thinking, their feelings,their preferences,their language, their food, their appearance and their religion. First of all, culture is not a biological trait for every native, it is learnt. Culture can be transmitted in various ways. Some of them are: By imitation,children sometimes imitate their parents and they learn their culture and traditions through this; from stories that older people like uncles, aunts, grandparents or parents narrate to their children and are related to their culture; from their language, which is an essential characteristic of culture that passes down from generation to generation and transmits a part of one's national identity. How does globalization affect culture? Globalization can affect culture sometimes.Through globalization it is easy for not so widely popular native traditions, languages, music and generally culture to be consumed in the mass of the most popular cultures of the most financially developed places. From my point of view, even though I don't follow all the traditions having to do with Crete or Greece, I still like culture as an idea and I feel sad when I hear that cultures are becoming extinct and forgotten because of globalization.I feel like one's culture is a part of their identity and shall not be forgotten that easily.